I’m a librarian and I take research seriously. When I was flirting with the idea of becoming a vegetarian in January 2012 I didn't make the commitment until I made sure that I could support my athletic pursuits and general nutritional needs on a vegetarian diet. I found some research studies in our medical databases, but I wanted some more real life stories, support, and examples. I’ll let you in on a librarian secret, the best way to search (anywhere) is to first use the right words or terms. During my library searching I realized that the word athlete was giving me the best results in looking for research on how plant based diets support active people. When I took my search out to Google one of the first websites I found was No Meat Athlete. This website, more than anything else in my initial searching, convinced me that I could not only survive but thrive on a plant based diet. Matt Frazier is the athlete behind the site which is built upon blogs/articles written by Frazier and others. The beauty of the site is that reading the articles is like sitting down with a friend. They are very approachable, not preachy, and cover the important points of different issues without getting bogged down in minutiae. 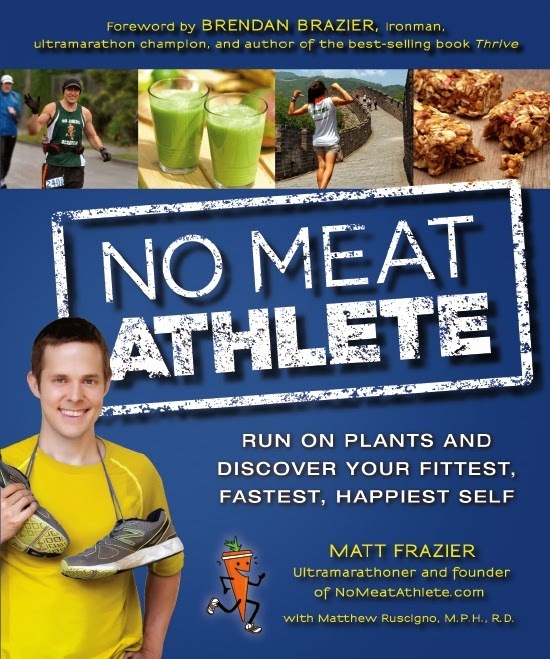 I also listen to the No Meat Athlete podcasts and was excited to hear that Frazier was publishing a book. I was especially excited to find out it would include a half marathon plan, because I was considering buying No Meat Athlete’s virtual “Half Marathon Roadmap” for awhile and saw this as a good option. I also appreciate the quality of No Meat Athlete’s free content and wanted to do my part to support the site. I pre-ordered the book, which came with some cool perks like extra content and webinars, and received it a few weeks ago. I actually read (most) of it cover to cover even though I was familiar with a majority of the content. Just like the blogs/articles, the book is written in a highly readable style. It’s most impressive for its handling of the main topics of the book: plant based diets and running. 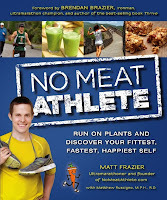 Frazier discusses the benefits of a plant based diet without making the reader feel guilty for not being ready to commit to it yet. He covers the health, environmental and moral benefits comprehensively without being overbearing. I would give this book to anyone considering a plant based diet, and I’ll probably give it to a few important people in my life for Christmas. The second half is about running. As mentioned in my last post, I've started falling in love with running so this section was fun for me. It really makes you feel like anyone can become not just a runner but a successful runner who can accomplish any goal they set. I had already started my half marathon training when I got the book, but have modified the way I do my interval runs based on Frazier’s plan. The book has plans for a 5K, 10K, and half marathon that are very easy to follow. I should mention that there is a large recipe section. I have been scouring plant based books/blogs for almost 2 years now and I still found recipes that I’m excited to try like Momo Granola Bars, Buffalo Hummus, Chopzilla! Salad and Black Bean Brownies.